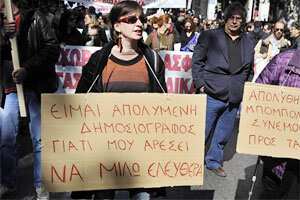 A Greek journalist carries a placard during a 24-hours strike on 18 October in Athens. Photo: AFP. Brussels: Some euro zone countries want a European Commission task force to be given extra powers to oversee the sale of Greek state assets and the country’s civil service under a far-reaching plan to tighten supervision of Athens, EU sources told Reuters. The European Commission said no such plan was in the works. Euro zone leaders meet on Sunday to discuss further aid for Greece, with countries such as Germany and the Netherlands frustrated by Athens’ lack of progress on privatisation and other reforms. Tighter controls are high on the agenda. “Support for stronger supervision", in the words of one official, partly reflects dissatisfaction in countries such as Germany, the Netherlands, Austria and Finland towards Greece and its failure to bring its finances more rapidly into check. Emphasising the need for far tighter oversight of Greece’s economy, one euro zone source who supports the idea of giving the Commission task force more power said: “It’s that or not getting the money." The source added that there was a need to “take over some of the sovereign functions of the state" to “get the machine running". “It is assistance imposed from outside. It’s where outsiders take over some elements of the operation," he said of the proposal, which could involve deploying several hundred technical experts on the ground to administer Greece. “The idea is living in some capitals. There is no alternative." The European Commission denied any such plan was under consideration, saying it had not been approached by any country about granting executive powers to its Greece task force. “The task force is an administrative structure aiming at supporting the Greek authorities," a spokesman for the EU’s executive told a regular briefing. “An administrative structure cannot, under any circumstances, take over legislative, legitimate government in Greece or somewhere else." The Commission has already dispatched a small number of officials to Greece as part of the EU/IMF ‘troika´ that is responsible for assessing how well Athens is doing with meeting its budget deficit, growth and other economic targets. In addition, its task force helps Athens on tax reform and tapping EU structural funds. Under the proposal, which chimes with a Dutch initiative for countries asking for financial aid to be placed under “guardianship", the Commission’s Greece task force could be bolstered. The body, run by a German, Horst Reichenbach, would be handed some executive powers, giving it the final say over, for example, privatisations, the first source said. “The scale of the intervention is unparalleled," said the euro zone source. “If there was a track record of responsible management, such as in Ireland, things would be different. But that track record is lacking in Greece. “It is a matter of authority," he said. “There will be a lot of resistance. The formal authority is not in their hands -- Greeks must accept that." Greece is set to receive another €8 billion ($11 billion) of EU/IMF aid in November -- the latest payment from a €110 billion bailout agreed last year -- and is expected to get another multi-billion-euro package of support soon. With the economy stagnating, lenders are banking on Athens selling assets such as ports and power companies to raise funds. It has said it will generate €50 billion by 2015, but has so far raised roughly €1.3 billion via privatisations. Other officials, while declining to comment on the specific tighter-oversight proposal, said there was widespread political support to impose stronger policing on Athens. “Support for stronger supervision is certainly there," said one EU official. Another source said there was a desire to establish a permanent body to take on some of the work of the troika, which consists of inspectors from the Commission, the European Central Bank (ECB) and the International Monetary Fund (IMF). “You need someone who can speak Greek but who is not on the side of the Greeks," said the source. “Their powers would be tied to the conditionality of the loan. It has to be presented carefully -- call it technical assistance or something. You can’t trample all over them." Such a blatant move to impinge on sovereignty would put the European Commission in an uncomfortable position. It wants a bigger role in setting national budgets, but draws the line at implementing them. While such a move may reassure lenders such as Germany that further loans to Greece are safe, it would likely antagonise Ireland, which would fear receiving the same treatment, despite having made rapid progress on spending cuts. One EU official cautioned that fierce resistance in Athens, Dublin and other capitals made the idea all but unworkable, as such a programme would require their support. “Giving the task force executive powers is an idea which has been in the air," he said. “But the Greeks would never accept that and neither should they."